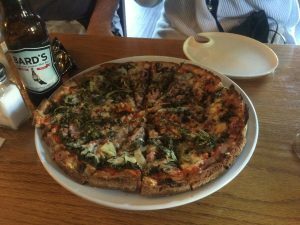 Six Mile Pub pulls out all the gluten-free stops – every Sunday! 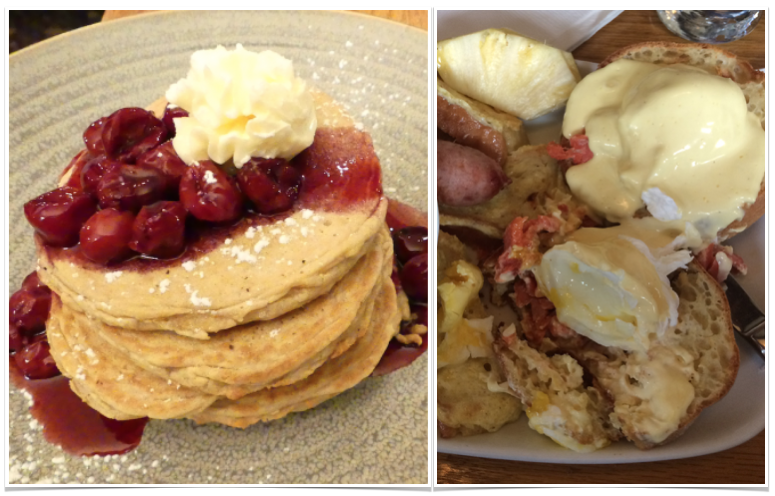 Gluten-free hotcake stack, eggs benedict, omelettes, hash browns and amazing desserts! Gear up with a Mimosa, a Caesar or even a gluten-free Bard’s Beer! Gots Kids? Ask to be seated in the Family Room and order from the Kids Menu! 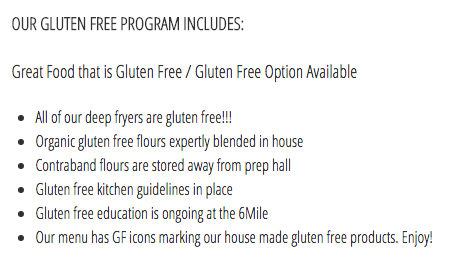 Six Mile Pub Believes in Great Food that Happens to be Gluten Free! TESTIMONIAL: Just had dinner last night at the 6 Mile Pub on Old Island Highway. Wow! I have eaten here before but was amazed again at the GF menu selection, presentation, deliciousness, and the feeling of safety eating there. We went with another family and it was so awesome that I could share food with others who easily ordered GF even though they aren’t Celiac because there is just so many good things to choose from. The calamari is the best I have had anywhere. All the deserts were gluten free. How is this possible I wondered? I asked the waitress and she told me the chef is Celiac! We need more Celiac chefs that are this creative!! I this has got to be best restaurant for dinner for Celiacs in the Victoria area. 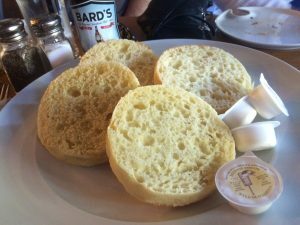 The 160 year-old View Royal pub that served the Gold Rush has set the gold standard for gluten free! Pub fare created with culinary flare, Six Mile is proud to serve ‘SIX-Nature’ chicken wings, deep-fried halibut and – wait for it – safe french fries & yam fries cooked in a dedicated deep fryer! Six Mile Pub’s Red Seal Chefs and their protégées pride themselves on meeting the needs of celiac diners and anyone with sensitivities i.e. dairy, soy, nuts or shellfish. The kudos continue – it is not necessary to call ahead to announce a gluten-free diner, but those with additional sensitivities will be treated like royalty if you let the chefs know at 250-478-3121. They’ve yet to meet an allergy they have not been able to accommodate. Six Mile Pub Videos – click here. There’s a cozy corner, a sun-drenched patio or a pool table just right for you. Families are welcome with a menu made with the celiac child in mind. The family room, open daily until 9pm also makes a great space for group functions. Gluten-free pizza is a Happy Hour feature everyday from 3 – 5pm made with Six Mile’s Signature Sourdough Crust. Six Mile produces its own light and fluffy gluten-free buns with a Celiac Scene Approved Secret Ingredient! That all the Pastas, Breads and Corn Tortilla Chips we serve are made fresh, right here in our own kitchen. That we keep our own Honey Bees in our Riverside Culinary Garden and Apiary to produce pure, unpasteurized honey for our Bar syrups and desserts. That one of our goals is to foster a healthier community by serving only wild Ocean-Wise seafood, “Drug-Free” meats and Organic produce wherever possible and practical. That it is important to us to help sustain the Local Economy by providing local employment and purchasing from Local farms such as Parry Bay Sheep Farm, Laughing Ducks Farm and Saanich Organics. That because of the purity of our food, many of our guests with Food Allergies and Sensitivities are now able to enjoy a proper “restaurant” meal. That we long for the day when ALL our Guests will already know that EVERYTHING we serve is made from scratch, on-site, and that we will no longer need to use terms like “house-made” and “fresh” to describe our food.